UK Radio Scanning Forum • View topic - Nest of halo's? This may seem like a strange question, but what are the rules with a nest of Halo's? I know that you have what amounts to a nest of loops in a Cobweb & that with dipoles I can place them in close quarters to each other. But what is the situation with a single single coax feeding a nest of Halo's? Other than for scanning I do not need a vertical on VHF. So I am thinking why have a three band vertical when it's only used for Scanning & 6 meters SSB. 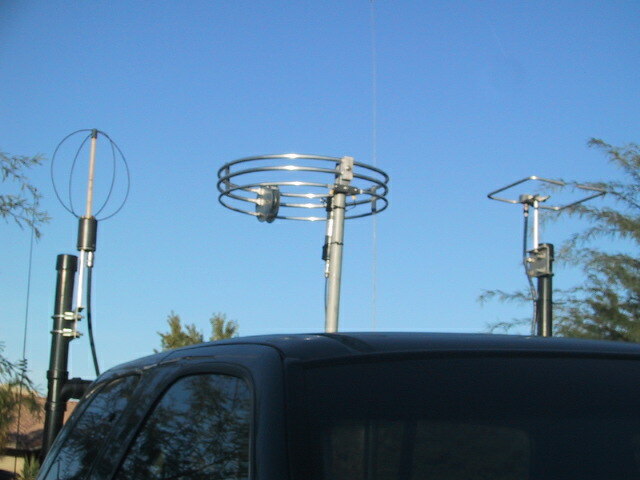 I have looked on Google, but cannot see anything to say if the rules are different for an antenna like a Halo over a dipole. Will I need to phase the coax between them? And if so in what order shortest to longest, or longest to shortest? A halo is ALWAYS used horizontal, never vertical. And I say that because Moonraker who should know better advertise thier 2 meter halo with an image of a vertically polarised halo!!!!!! But yes in effect very similar to a loop. My intention is a 6 & a 2 meter loop & fed via a single coax. There is nothing much bothering about true north of me, so I can work most directions with a halo. I had thought about something like a big Wheel / Clover leaf, which is 360 degree & has slightly better performance. But a halo will be less intrusive.